A few weeks ago, I shared some pictures of signs I had seen in Shanghai that were good examples of odd translations into English. While the signs in Thailand are generally more accurately translated, I did just recently run into one that made me pause. 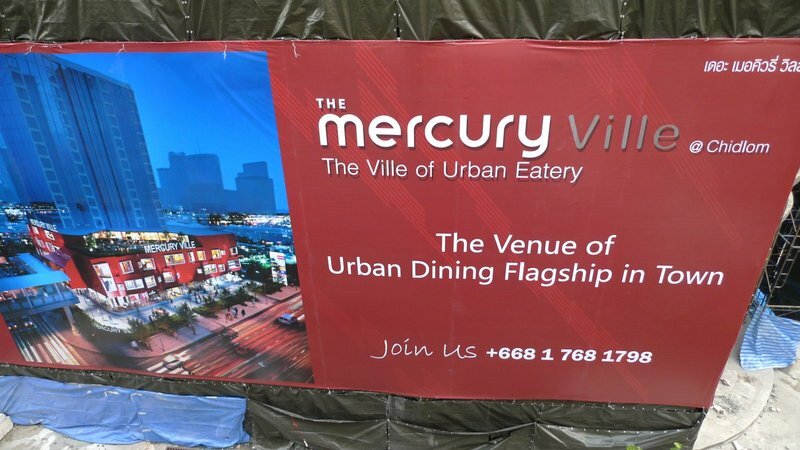 An office building across from Central Chidlom department store is being renovated and rebranded as The Mercury Ville @ Chidlom. The tag line: “The Ville of Urban Eatery. The Venue of Urban Dining Flagship in Town.” I have no idea what that means. This entry was posted in Uncategorized and tagged english, language, signage, thai, Thailand, thinglish by christao408. Bookmark the permalink. It must have been written by some of the sales people in my company. Translated from French to English to Chinese to Thai? If it’s what it looks like to me (a place where there’s lots of restaurants thrown into one location), it would be paradise. That said, I honestly have no idea what it actually means, haha. I think the important part they got right – Join us! @Grannys_Place – Thanks for the recommendation! @ElusiveWords – @Inciteful – Could be…@Fatcat723 – Does it? @mizz_chan – We can only hope your interpretation is correct. @murisopsis – True. @secade – Thinglish! yea, they make no sense either. Some of these translations really sound like they were done by the babelfish instead of a proper translation office. Another fun thing can be manuals translated. @beowulf222 – Oh, yes – let’s hear it for the crazy technical manuals. I was just translating something from work that I think came from HQ in Tokyo… not sure exactly what was meant but it sure doesn’t sound like it was written by a native English speaker. @marc11864 – Sounds very galactic.